Seattle Parks and Recreation invites the community to learn about proposed improvements scheduled for Ballard Playfield. Please join us on Thursday, August 23, 2018 from 7 to 8 p.m. at Ballard Community Center, 6020 28th Ave. NW. 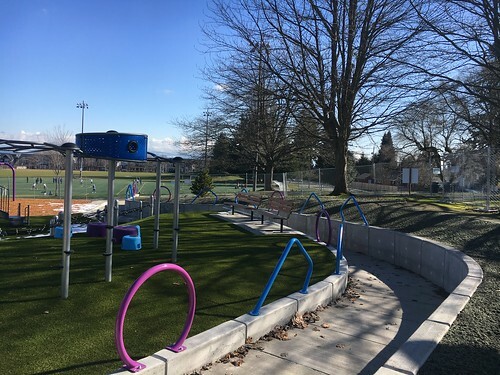 Ballard Playfield is well used by the community, especially by youth leagues, and this improvement project will help us meet our city’s growing demand for recreational facilities. The project includes installing two baseball synthetic turf infields, replacing the field lighting system, improving access to meet the Americans with Disabilities Act, and other field enhancements. Ballard Playfield is located at 2644 NW 60th St.
Seattle Parks and Recreation is investing in state-of-the-art synthetic turf systems that provide safe, playable and durable fields. Additionally, we are investing in high quality energy-efficient field lighting which minimizes light and glare impacts off the field while providing recreation light on the field. Seattle Parks and Recreation (SPR) invites the community to an Open House on Saturday, June 2, 2018 from 2 to 5 p.m. at Greenwood Park addition, 8805 Fremont Ave. N. The community is encouraged to attend the Open House in the park and provide input on the three design options for the addition to Greenwood Park. This is an opportunity for you to meet the design team, provide feedback on the future design, enjoy free activities and food, and get to know your neighbors. SPR purchased this .1-acre site at 8805 Fremont Ave. N in 2013 to provide more open space for the growing neighborhood and expand the existing Greenwood Park. The property is surrounded by Greenwood Park. The acquisition of the property was identified in the Greenwood neighborhood plan and the 2009 Greenwood Park Master Plan. The design of the new parcel builds upon several years of work and design from the community process led by Vision Greenwood. It will incorporate accessibility features in compliance with the Americans with Disabilities Act and reflect the community input received. 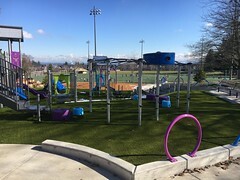 Funding for this park project is provided by the Seattle Park District. Approved by voters in 2014, the Seattle Park District provides more than $47 million a year in long-term funding to tackle the $267-million major maintenance backlog for Seattle Parks and Recreation as well as other facilities including the Aquarium and Zoo. 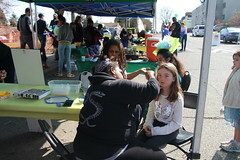 In addition, it provides funding to improve and rehabilitate community centers, preserve the urban forest, perform day-to-day maintenance of parks and facilities, provide more recreation opportunities for people from underserved communities, provide programs for people of all ages and abilities, and acquire and develop new park land. Thank you to the North Seattle Boys and Girls Club and Vision Greenwood for their partnership. Seattle Parks and Recreation (SPR) invites the community to a public Open House for the renovation of Soundview Playfield on Tuesday, April 17, 2018 from 6 to 7:30 p.m. Join SPR’s staff and BRCA Design consultants at Loyal Heights Community Center, 2101 NW 77th St., to provide comments on the final design for Soundview Playfield renovation. The proposed project for the Soundview Playfield, 1590 NW 90th St., will include installation of synthetic field surfacing, the addition of lighting, access improvements that meet the Americans with Disabilities Act, and other site enhancements. SPR is investing in a state-of-the-art synthetic turf system that provides safe, playable, and durable fields. Additionally, we are investing in high quality energy-efficient field lighting which minimizes spill light and glare while providing recreation light on the field. Synthetic turf and lighting improvements will be prioritized on the lower field, and we anticipate providing additional improvements for the upper field as the budget allows. These upgrades will also address recreational demands and repair field drainage issues. 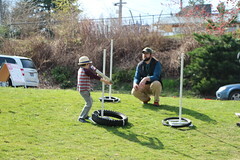 For more information please visit http://www.seattle.gov/parks/about-us/current-projects/soundview-playfield-athletic-field-renovation. For questions about the project or if you need an interpreter or accommodations please contact Karimah Cooper Edwards, Seattle Parks and Recreation, at 206-233-0063 or Karimah.edwards@seattle.gov. Seattle Parks and Recreation, University of Washington and the Arboretum Foundation invite the community to the grand opening celebration of the Washington Park Arboretum Loop Trail on Sunday, April 8, 2018 from noon to 3 p.m. The day will be filled with festivities along the path, including music, free snacks, food trucks, a talk by outdoors writer Craig Romano and an opportunity to explore the new multi-use trail. The official opening remarks and “vine-cutting” ceremony takes place at 1 p.m. at the Birch Lot off Lake Washington Blvd. E.
The new multi-use trail daylights the creek, provides greater access to the wetlands and plant collections, and supports education, recreation and conservation efforts at the Washington Park Arboretum. Click here to read more about the completion of the trail. Parking is limited and organizers are encouraging people to carpool, take public transit, bike or walk to the event. Click here for event details. Seattle Parks and Recreation (SPR) invites the community to join in the celebration for the expansion of Hing Hay Park on Saturday, March 24, 2018 from 1 to 3 p.m. The event will begin with a lion dance from Northwest Kung Fu & Fitness followed by the official ribbon cutting and a performance by the Seattle Chinese Community Girls Drill Team. The afternoon will be filled with fun activities including face-painting, park games, fitness instruction and light refreshments. Hing Hay Park is located in the heart of the Chinatown International District at 423 Maynard Ave. S at the corner of 6th Ave. S and S King St. This project doubled the size of the original Hing Hay Park. Hing Hay literally means “pleasurable gatherings” and the park serves as an important community gathering place for the neighborhood. The park opened in June 2017 and in February 2018 Studio Fifty50 installed the final design element of the expansion project, the iconic artistic gateway. It is a geometric red metal arch that welcomes the community into the park and defines the entry. The abstract perforations in the gateway represent leaf patters, an inclusive pattern representing all cultures in the Seattle Chinatown-International District. It is made of similar red metal used in the seating and stairs at the park. The new park design includes a cultural performance space, with custom integrated seating that punctuates the terraces and provides micro-stages, activity areas for all community members to enjoy, including ping pong tables, seating, exercise machines, a badminton area, and shade trees. Other features include planted terraces, lighting, necessary utilities and sidewalk improvements with ADA accessibility through the park. The team of MIG|SvR, a local design firm, plus Turenscape, a Beijing-based firm, created the park design that reflects the many cultures of the neighborhood and seamlessly embraces the old with the new. InterIm CDA and SCIDpda provided outreach support and together we hosted a series of community outreach meetings, and gathered input from local organizations and Friends of Hing Hay Park. SPR purchased the International District Station Post Office site with funding from the Pro-Parks Levy to expand the original park. The 2008 Parks and Green Spaces Levy provided the development funding and brought the community vision alive. SPR and our partners in the event, SCIDpda, InterIm CDA, Chinatown-International District Business Improvement Area, and the Friends of Hing Hay Park encourage the community to visit the park and join in the celebration. Thank you to Unstill Life Fitness Coaching for providing instruction on the adult exercise equipment machines. 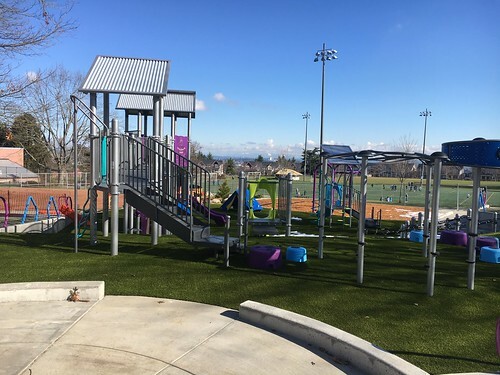 Seattle Parks and Recreation(SPR) is happy to announce that the play area at Victory Heights Playground, 1737 NE 106th St., 98125, is open. The community is hosting a ribbon cutting celebration on Sat., February 10 from 10 to 11:30 a.m. at the park and encourages all to attend. 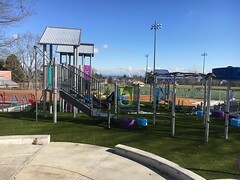 The park improvement provides a renovated accessible playground and features new play area equipment for children ages 2 to 5 and 5 to 12 complete with new slides, net climbing elements, swings, musical instruments, a merry-go-round, and a deluxe coupe car climbing element as requested by the public. The improved picnic area creates an inviting community space with additional picnic tables and seating. The project also reconfigured the basketball court and now offers a separate sand play area. The renovation project includes a loop path around the perimeter of the park and a repaved basketball court. This work will occur in spring 2018. Seattle Parks and Recreation (SPR) invites the community to an Open House on Tuesday, February 13, 2018 from 5:30 to 7 p.m. to provide input on the design of the new parcel at Greenwood Park. The Open House is at the North Seattle Boys and Girls Club, 8635 Fremont Ave N. 98103. Neighbors of all ages are encouraged to attend and review design elements and provide input on park elements for the new site. Light refreshments and a Valentine’s Day craft project will be available. SPR purchased this .1-acre site at 8805 Fremont Ave N. in 2013 to provide more open space for the growing neighborhood and expand the existing Greenwood Park. The property is surrounded by Greenwood Park. The acquisition of the property was identified in the Greenwood neighborhood plan and the 2009 Greenwood Park Master Plan. The design of the new parcel will incorporate accessibility features in compliance with the Americans with Disabilities Act and provide access to open space within this high density urban village. Thank you to the North Seattle Boys and Girls Club for their partnership. The first round of the community-initiated projects, announced in December 2016, provided small awards for feasibility and preliminary design work to help define the scope of potential future projects and awards to two construction projects, Kubota Garden Ornamental Walls and Gates, and Amy Yee Tennis Center Improvements. 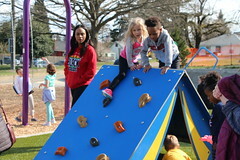 The MPCF awards were based on screening criteria that included an equitable prioritization scoring matrix, and came recommended from the Seattle Park District Oversight Committee and confirmed by Seattle Parks and Recreation’s Superintendent. As with the last round of the MPCF, a portion of the funding will be allocated to assist diverse communities and organizations that lack resources for a match. Groups that are unable to identify any match should contact David Graves at david.graves@seattle.gov or 206-684-7048. Mr. Graves can assist groups with the funding process and help identify funding source(s) for submitting the application. annually until 2020 and will improve existing off-leash areas through increased maintenance while providing updates to aging infrastructure. In 2016, we completed a capital plan for all OLAs, People, Dogs and Parks Plan. This plan provides a scope and prioritization of projects. The first project completed under the plan was a new fence around the 8.6-acre Magnuson Park OLA. The next two projects include improvements for Genesee Park and Woodland Park OLAs. At Genesee Park we are building a new small- and shy-dog area. Construction will begin February 5 and last for one week. During construction the OLA will be closed. The Woodland Park improvement will also install a small- and shy-dog area to replace the fence around the wooded area inside the OLA. This work will start the week of February 12 and require closure of the OLA during construction. We anticipate construction will last approximately two weeks.